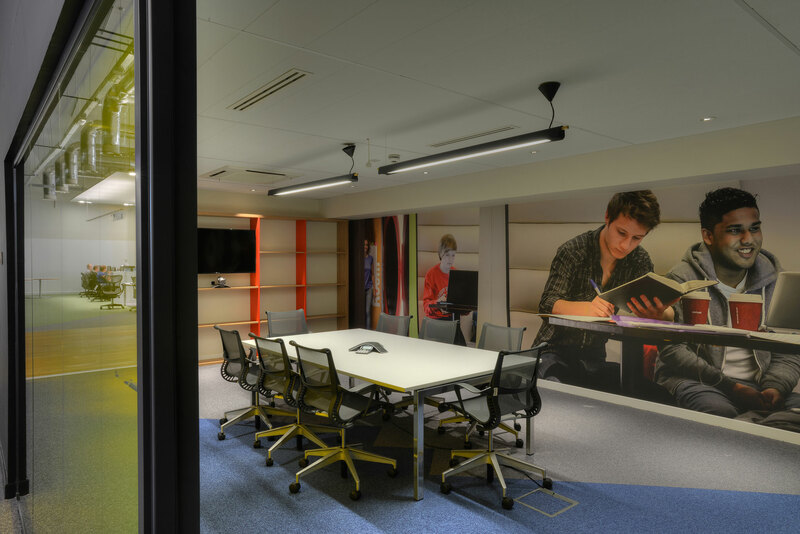 Graven designed the state-of-the-art Data Centre and workplace Student Loans Company, Hillington. 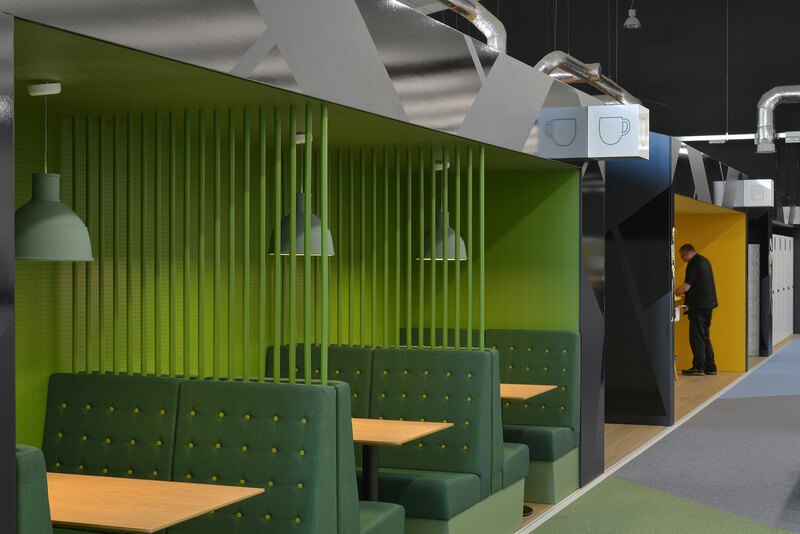 Graven has transformed a previously uninspiring industrial unit into a state-of-the-art Data Centre and dynamic workplace environment for SLC designed to promote innovation and adopting new ways of flexible working. 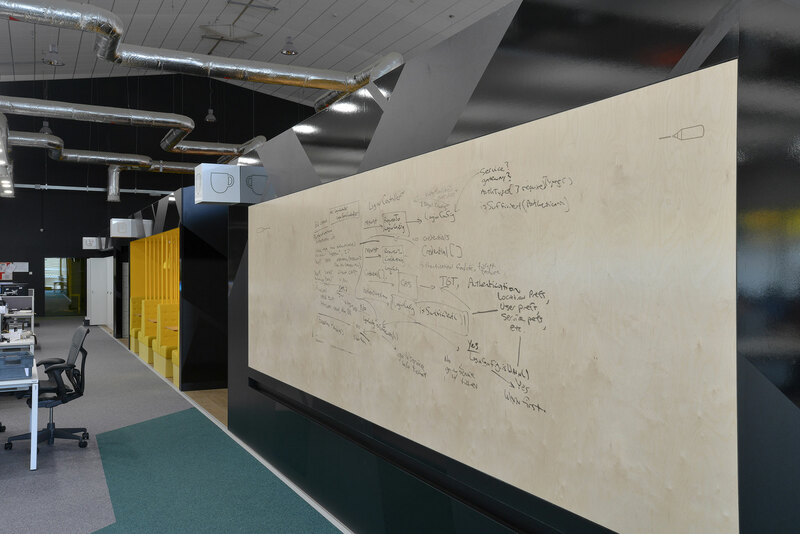 The new Data Centre houses the organisation’s key infrastructure and services supporting their staff, over 7 million customers and a £90bn loan book. 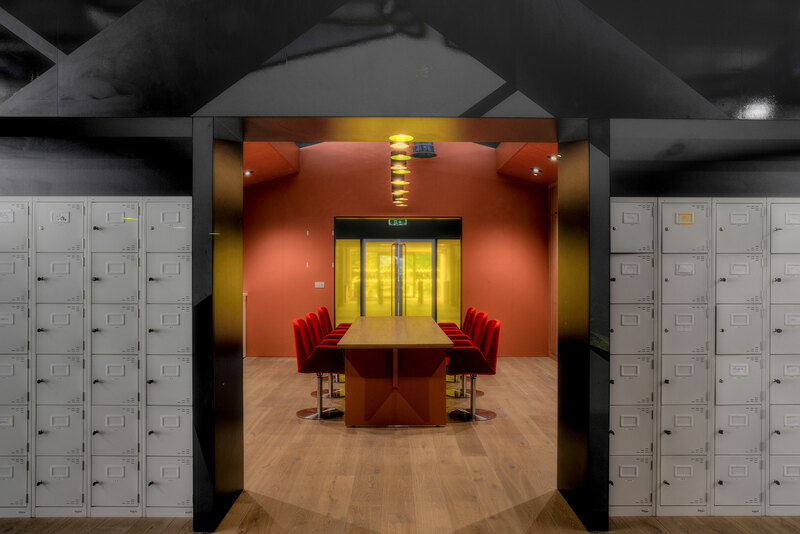 The principal challenge was to reuse the existing industrial building housing an out-of-date data processing and in-house printing and mail distribution facility to create a low environmental impact, diverse, robust and future proofed Data Centre with resilience. It was important to create a high quality environment to achieve a fully integrated project balancing the ICT requirements and core business requirements where the most critical processes of SLC are run. All this was achieved, with all existing services staying live throughout the build and transition period ensuring no loss of data services to SLC, its customers, and Universities throughout the UK. 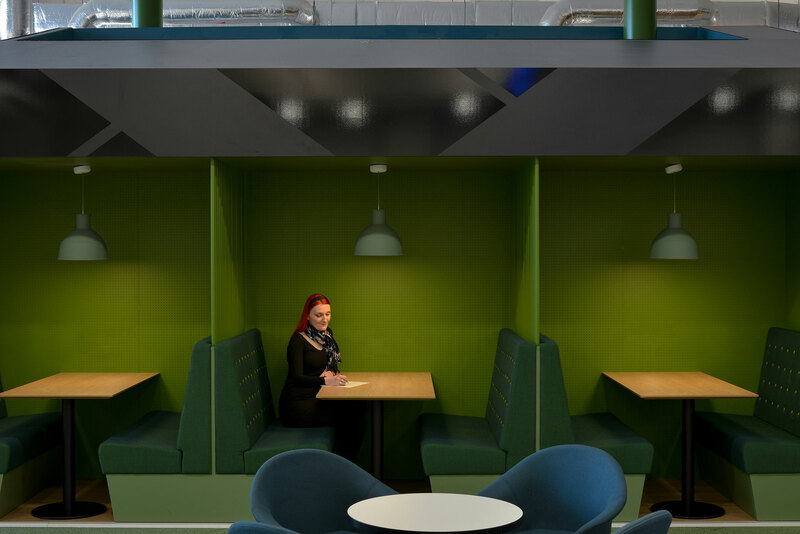 The approach was to locate bench style desking towards the external elevations and to create a functional central zone to accommodate key circulation and a variety of meeting spaces while internal breakout booths and touchdown areas offer social and more informal spaces to work. 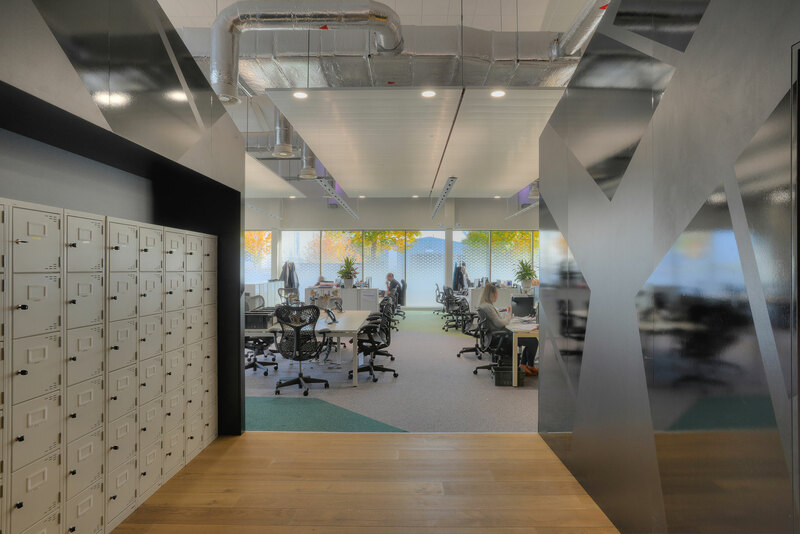 The central hub structures and their roof profiles create a playful and striking vista right through the heart of the space leading the eye deep into the main workspaces and the central walkway. 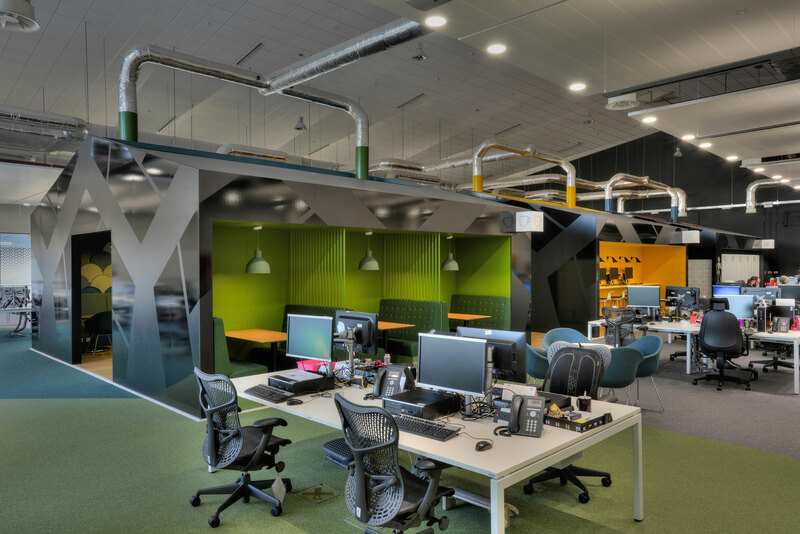 The industrial setting and mix of quality sometimes surprising, materials along with colour and texture is a fitting evolution from SLC’s Memphis Building in Darlington, originally built as the landmark Patons and Baldwin thread factory, also redesigned by Graven. 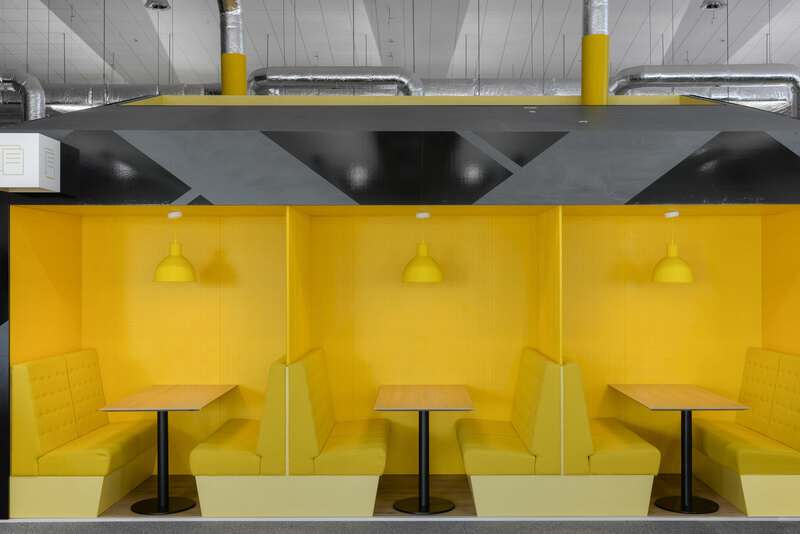 Finishes were kept minimal with strong colour in the central walkway and booth settings. 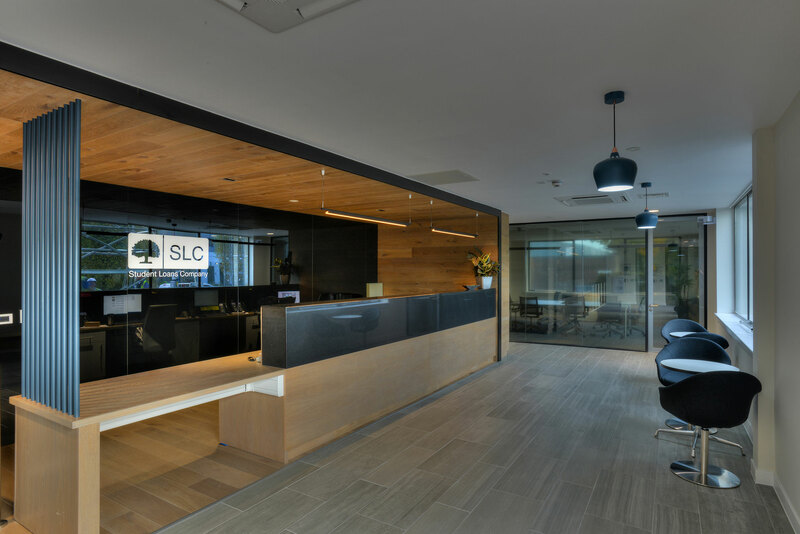 Graven also developed SLC’s environmental branding and wayfinding strategy throughout the building. 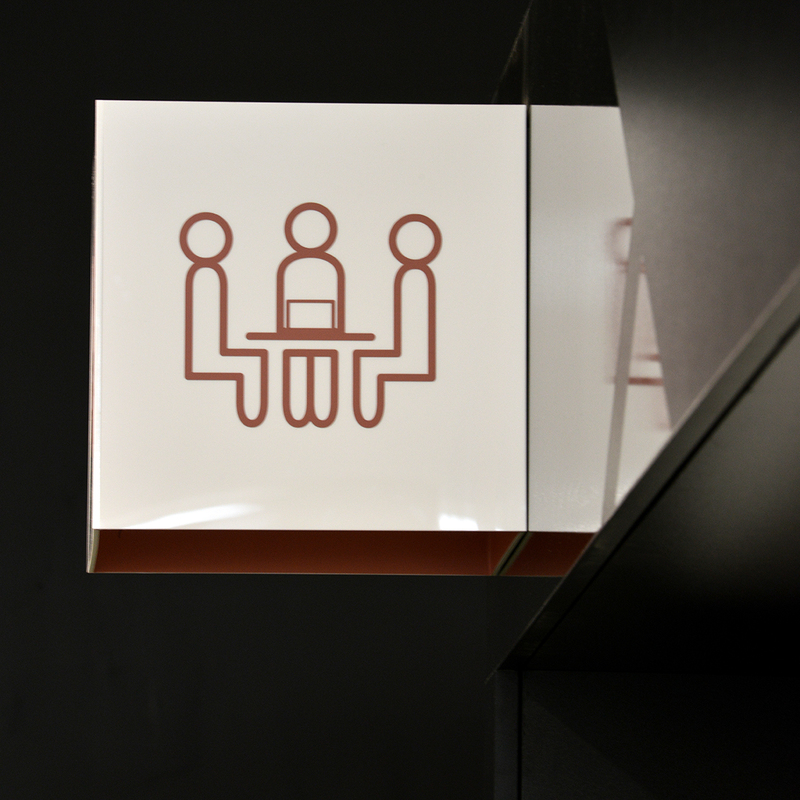 Clear messaging, bespoke branded signage and large-scale environmental graphics within the meeting rooms act a reminder of the end user. 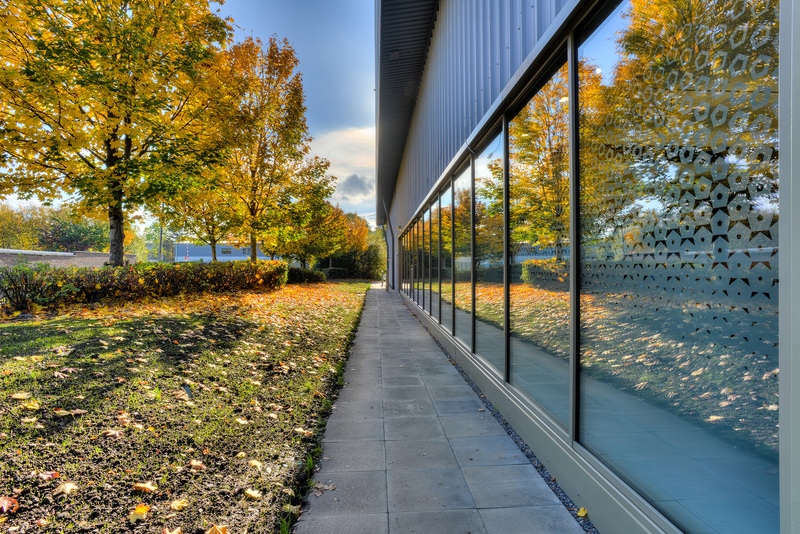 The manifestations incorporating the SLC branding to the external glazing provide a layer of privacy and security as well as adding pattern and a play of light. 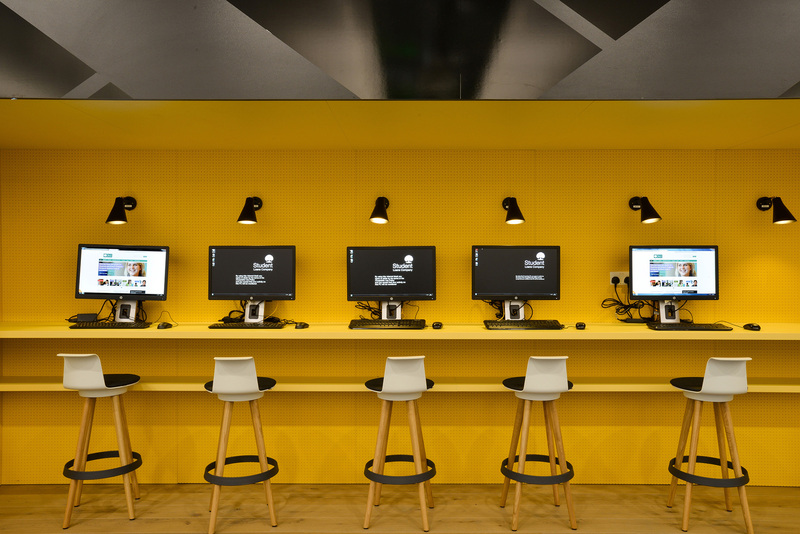 Student Loans Company has a clear long term vision of how they will work and that is very much informed by their ‘Agile’ principles developed through their IT and digital processes. 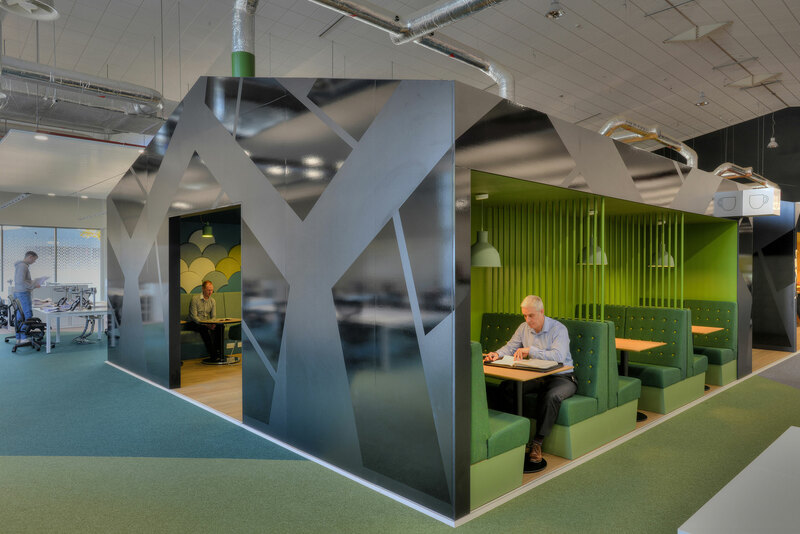 That thinking was supported by Graven to reflect the values of SLC, particularly their creativity, new technologies, new processes, their requirements for future flexibility, and their commitment to new ways of working; sharing, collaboration, and team work. Graven’s creative, solutions-based, approach to drive practical benefits was facilitated by the British Standards (BSI) PAS 3000 Code of Practice, which came into effect in 2015. 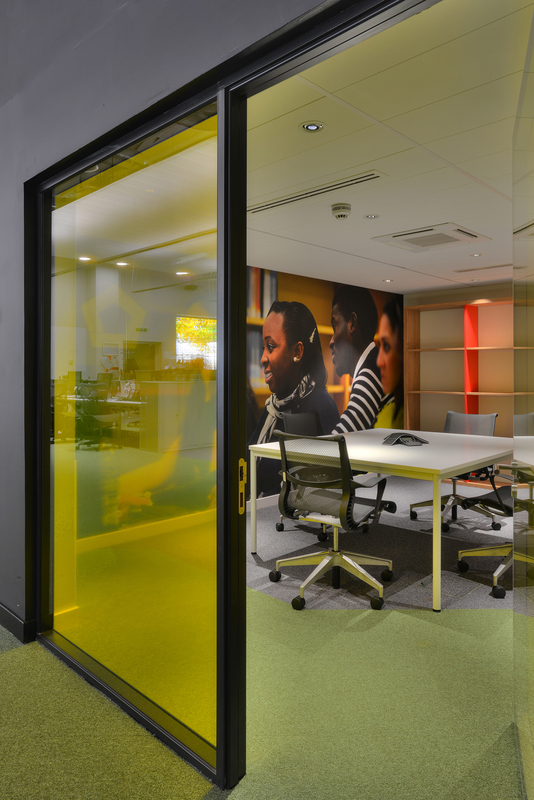 Student Loans Company (SLC) Hillington is a British Council for Offices (BCO) Awards finalist, in the Refurbished/Recycled Workplace category. 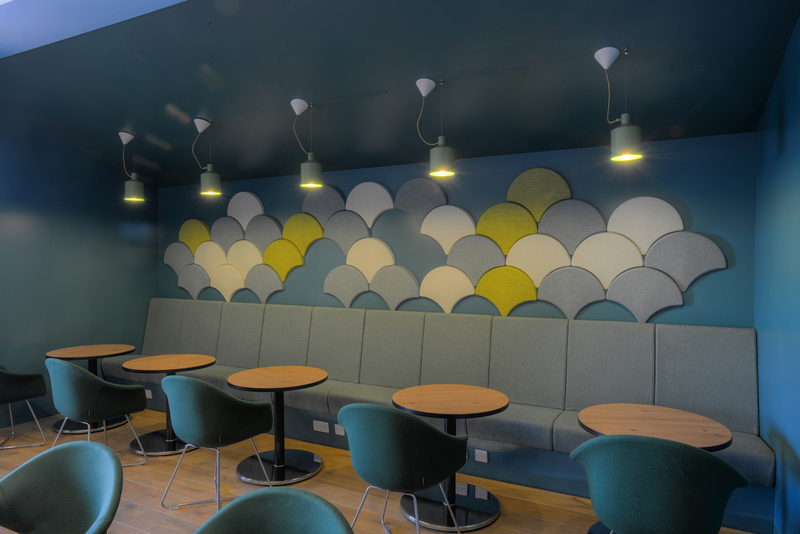 Graven previously won British Council of Offices (BCO) Awards for SLC’s Memphis Building in Darlington, which was awarded a BCO Award for best Refurbished/Recycled Workplace in the UK in 2009 and five years later the BCO Test of Time Award in 2013. 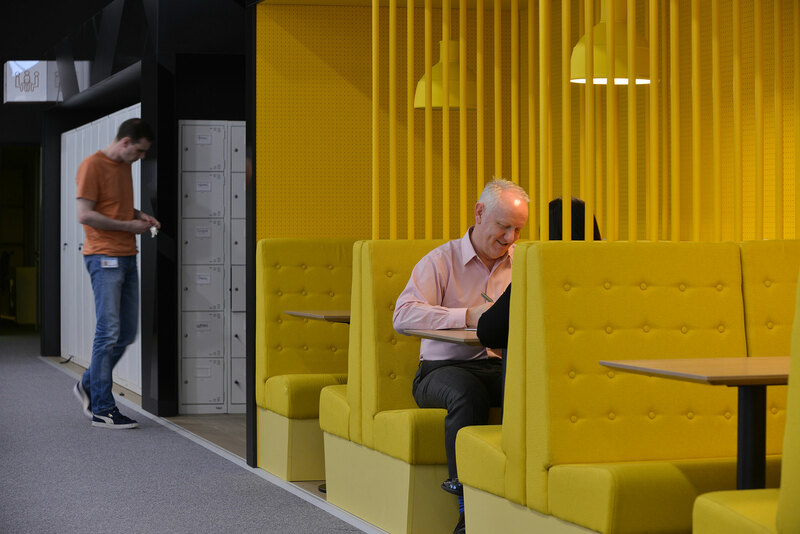 The BCO Awards recognises high quality office design and functionality and provides a benchmark for excellence in the workplace and SLC Hillington has been similarly recognised as an exemplar of good practice.